I was born in Memphis, and I was a tomboy. I shot marbles, and I have the ugliest knees that you could see now! I wanted to be a boy. In the old days, they had a saying that if you kissed your elbow, you would turn into a boy. I have tried so many times to turn this elbow up so I could kiss it and be a boy! My mother — Georgia Harriet Graves Dancy — was a substitute teacher. They wouldn’t hire women as full-time teachers if they were married. She was also an excellent seamstress. In the Cotton Carnival days, my mom would help make the costumes. Then, when the black Cotton Makers Jubilee took place, they took the outfits the whites had worn and fixed them for the blacks to wear. My mom was given the privilege of being a stay-at-home mom to make sure we did what was right. My father was Andrew Jackson Dancy, and he was from Canton, Mississippi — 126 Hickory Alley. He worked as a bellhop at the Gayoso Hotel. Of the three children my mother and father gave birth to, I’m the darkest. In those days, black people attached a lot of significance to how light or dark you were. The lighter you were, the better. My father was a frecklefaced man; my mother’s side was white. I came home after graduating from Fisk University, and the city would not hire me. They said I had gone to a prestigious school and probably didn’t need to work. So I got a job in the county. I drove 25 to 30 miles every morning to Barret’s Chapel School where I was a physical education teacher and coached girls basketball — which I knew very little, if anything, about. In 1949, I went to the Tri-State Fair. That’s when blacks were separated from whites, and we had our own fair. One of my mom’s friends had a drugstore at the corner of Walker and Mississippi. She was selling soda pops, hotdogs, and whatnot at the fairgrounds, and I went out to help. I was working at the stand and along came Benjamin Hooks. He knew my mother’s friend, and they started talking. Then we started talking. He asked if he could take me home. I had to call my mom and ask her. Me, a college graduate, asking my mom if a man could take me home! We went to Tony’s, which was the big place for blacks back then. I was interested in learning about him, one of the first, young black lawyers in the area. He asked if he could see me again. We got married March 24, 1951. Benny’s law office was on Beale in the same building where his father had a photography studio, and Benny was involved in all kinds of social and civil rights activities. But I wasn’t. I was the one who took care of Benny when he came home bruised. I was the rock. In 1965, Governor Clement appointed Ben as a Shelby County Criminal Court judge. This marked a new height in both of our lives, and Ben began traveling incessantly. In 1972 President Nixon appointed Benny to the Federal Communications Commission board in Washington D.C. — the FCC’s first African-American board member. I was shocked! But it was an important move, and having gone to school at Howard University — before I went to Fisk — I knew a little bit about what the Washington scene was like for minorities. I went with Benny and helped out there. I wanted to help him in any way I could; I could type and I could take my limited version of shorthand. I was there, his Girl Friday. Benny resigned in 1977 to become executive director of the NAACP. 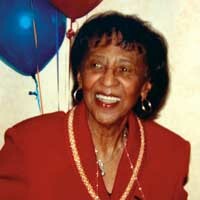 Earlean Bolden, who was already active in the NAACP, and I created the Women in the NAACP. I also co-founded The People Power Project, which promoted black and white dialog. So I was active in my way. I was a part of the movement, but I never wanted to be at the forefront. One Hooks is enough. Other people are just as important to the movement, so let them lead. I’ll go behind the stage and pull the strings; you go onstage and act. Today, most of what I do is try to keep him straight! He has several “full-time jobs.” Since he got the call to pastor the church, it’s been a full-time occupation for me. I haven’t regretted it because my grandmother was a minister, so I knew that the church came first, and family came after. But Ben Hooks has been the kind of personality that included his entire family. He’s just been a rock for everybody to lean on. And if you got in the way, sometimes you got hit by the rock! laughs As for me? I am Benny’s rock. I could throw it at him, or I could let him lean on it. I wouldn’t be where I am today if I hadn’t had parents who were tough — and who were determined that we advance. I have never really wanted for anything that I didn’t have the opportunity to go after. The only thing — when we were young, my sister was a redhead, and people would say how cute she was. I wanted to swap places with her so I could get the praise and adoration she got! I’ll always remember my grandmother at the breakfast table. She was a minister, and we would pray and pray and pray. My mother would finally break into Big Mommy’s prayers and say, “All right, children, it’s time for you all to eat.” Big Mommy would get so mad! When President Nixon appointed Benjamin as the first black on the FCC it was on the advice of Senator Howard Baker, and we will always be grateful. But I remember thinking, what is the world coming to? I couldn’t believe it! What a thrill! But I knew it was going to be a challenge with different personalities and different ethnic groups. I had never been exposed to that. So it was a great opportunity to learn more about other people. They accepted me, and I accepted them. The most important thing in life is making sure the family is satisfied and happy with all the things that come and go. As I child, I dreamed I would be a doctor. I just wanted to heal people. I was in pre-med at Howard University, but the chemistry I had taken in high school just didn’t fit with the chemistry at Howard University! So I sought another avenue. I never dreamed I would end up as a teacher. I didn’t know until later that while my mother was sewing costumes for the white Cotton Carnival and altering those costumes for the black Cotton Makers Jubilee, my husband — though only a boy — was doing the same thing with the floats and parade equipment at Booker T. Washington High School’s carpentry shop. I’ll never forget the day I got married. I was still living at home with my parents. There weren’t a lot of places where you could have receptions and things for black people, so the reception was going to be at our home on Edith. I had to leave the church after I got married, rush home to make sure everything was in its proper place for the so-called uppity-uppity folks to come by and wish us well. I made sure the breakfast room was clean, the kitchen was spotless. My mother was one of those sticklers for making sure everything was in its proper place. My most fearful moment was when Benny got a defibrillator. His heart is not in the best of shape. My childhood home was in South Memphis on Edith Street — a three-bedroom brick house with an attic and a basement. They were all upwardly mobile homes, and everyone was gainfully employed. Our neighbors were doctors, postal workers, and teachers, so we were backed by middle-class people in those days! Edith Street was considered the street in the black community. People don’t realize how tough life can be. When I was growing up, black people had not yet come into their own. We were still struggling to find our identity. It’s pretty hard to describe what life was like if you were not in that era. If I could meet one person it would be Michelle Obama at this juncture in her life. Having had some exposure to the White House and the muckety-muck in Washington, I would like to meet a woman who has survived it all and still carries a degree of dignity and poise that a lot of people aspire to. To me, she has faced these obstacles and has been a lady all the way through. She’s a gift. He’s a lucky man to have a woman like her. She doesn’t try to get in front of him or be something other than who she is. I just respect her so much. She is his rock. The greatest honor is living! Just being alive. From my father, I got my sense of frugalness. You don’t spend if you don’t have. You’re always polite — he got that from being a bellhop. If I could do one thing over I would be born again, but that would be impossible. One of the people who impressed me most was my godmother. She was a teacher and my mother’s best friend in the world. She never let people or circumstances keep her from being the person she was. From her, I got a sense of knowing who I was. She was such a stickler for doing what’s right. I’m always mistrustful of myself. Sometimes I don’t believe the things that are happening to me. Sometimes I doubt myself. Our daughter, Patricia is Benny’s brother’s child. We helped rear all of his brother’s children, but we legally adopted Pat. I pay a personal price when I don’t do what I’m supposed to do — or when Benny and I disagree, which is when I don’t have my way! Benjamin Hooks became involved in the Civil Rights Movement when … There wasn’t a particular “start time” when Benny became involved. He has always been motivated to try to correct a wrong. He had that even when he was a judge. Did I fear for him? Oh, yes. I sent up a lot of prayers and trusted God to make sure he made it home safely. Early on I realized what my role was. My life was divided. When I came in from teaching school in the county, I would go to Benny’s law office and type, separate papers, whatever needed to be done — just to be with him, really. Those are the things I did. The most valuable lesson I was taught was to keep my nose out of other people’s business. Growing up in my neighborhood we had an environment that straightened you out if you even thought you were going to do something wrong! Basically, then, we were owned by everybody on the darned street! You were just watched all the time, and if you were caught doing something wrong, somebody would tell your mother, and you would get a whipping — a real whipping! The greatest joy is being married to a solid, wonderful, giving, kind person like Benjamin Hooks. My final 2 cents is hey, what do you want to know? Anything! What can I do for you now?